← 53rd Girl Scouts National Convention! 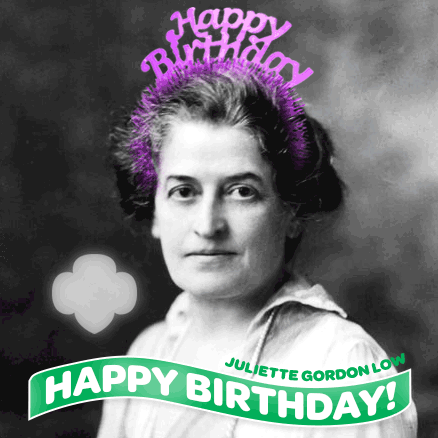 Happy Birthday to Juliette Gordon Low! This Friday, October 31st, is not only Halloween, it’s Juliette Gordon Low’s birthday! Born in 1860, this year would have been her 154th birthday! In Girl Scouting, October 31st is also known and celebrated as Founder’s Day. Every so often, throughout the years, the handbooks and/or badge books for Girl Scouts change and evolve with the times, but one thing remains the same: they include the story of Juliette Low. 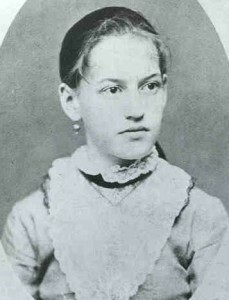 She was born in Savannah, Georgia and nicknamed Daisy as a child. Her life since childhood had been filled with a lot of trials and strife including the loss of most of her hearing as a young adult and the death of her husband at about the turn of the century. In her search for a sense of purpose, especially after her husband’s death, she began traveling the world and in 1911 in England she met Lord and Lady Baden-Powell and her life was changed. Lord Robert Baden-Powell is the founder of Boy Scouts and his sister Agnes was the leader of the early Girl Scouts, known overseas as Girl Guides. Inspired by Baden-Powell, Daisy began the first Girl Scout troop in America in 1912 and the rest is history. Girl Scouting in America has grown from 18 girls during that first meeting in 1912 to a membership today of over 3 million girls and adults. Daisy has left a legacy that we hope will live on forever. If you want to learn more about her life and Girl Scouting, you can go to the Girl Scouts USA website to read more and check out the links to read her biography, watch videos, and more. Posted on October 27, 2014, in Juliette Low, Savannah and tagged birthday, Juliette Gordon Low. Bookmark the permalink. 1 Comment.